As a single golfer you cannot apply for an Old Course ballot tee time? There must be at least 2 golfers on the application. My unique, free and simple-to-use BallotBuddy service helps you find an Old Course ballot partner. Score a date match so you and your fellow golfer are eligible to submit an Old Course ballot application together. Currently your only option is to ‘walk-up’ on the day. Get up early and join the line outside the Old Pavilion. Chances of play that day are reliant entirely on gaps on the draw sheet and your place in the line. So why not try BallotBuddy? 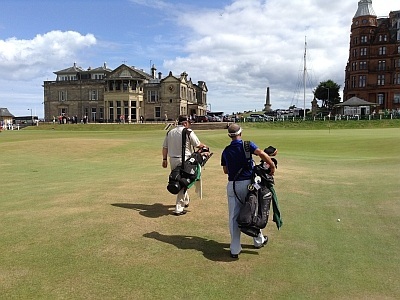 Decide when you are coming to St Andrews to play the Old Course via a ballot time. Register for my free BallotBuddy service. Submit up to 5 dates. Post the news of your BallotBuddy registration on your social media accounts. Share widely with your friends & contacts. Ask them to share your news too! Your dates will be added to a database of other BallotBuddy golfers looking to team up. If you get a date match with a 2nd golfer (or more, up to 4), I will connect you to your BallotBuddy via email introduction. The BallotBuddy Match which Chris, from the Ginger Beer Golf Travel, has initiated is a super service. 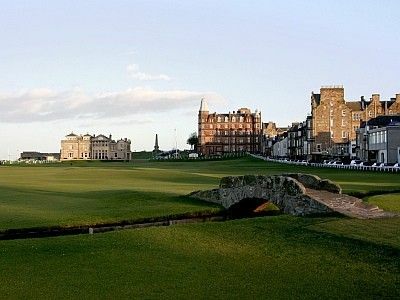 As a single golfer visiting St Andrews from South Africa I was fully aware of how difficult it would be to play the Old Course. 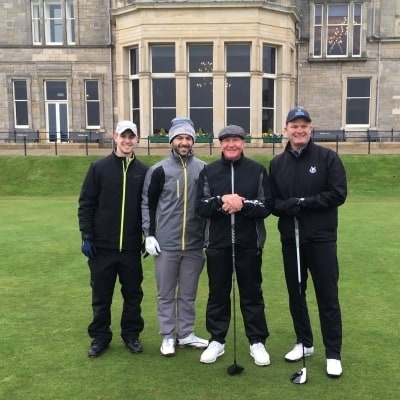 However Chris paired me with other single golfers and we were then able to enter the Old Course Ballot. I was successful on three occasions playing with fellow golfers from around the world. Whilst it does not guarantee that you will be successful in the ballot, it provides an opportunity to enter. It is truly a super initiative which Chris offers at no charge. Thank you Chris. As a 2 ball you are now eligible to apply for an Old Course ballot time. It is down to you and your BallotBuddy from this point forward. More than 2 golfers with a date match? You should apply together for a ballot time (up to a maximum of 4 golfers). You can still use the ‘walk-up’ option and wait in line to play. Read more about your chances of play in my in-depth report on the Single Golfer at St Andrews. The success of this scheme relies 100% on your goodwill and honest intentions. - I grant Ginger Beer Golf Travel permission to share my available dates above on its own website or other marketing channels for the purposes of soliciting other participants in the BallotBuddy scheme and, ultimately, to find me a BallotBuddy. Please note this excludes sharing personal information. - I grant Ginger Beer Golf Travel permission to share my contact details with any other participant(s) in the BallotBuddy scheme where there is a date match, i.e. where at least one of their available dates matches at least one of my available dates above. 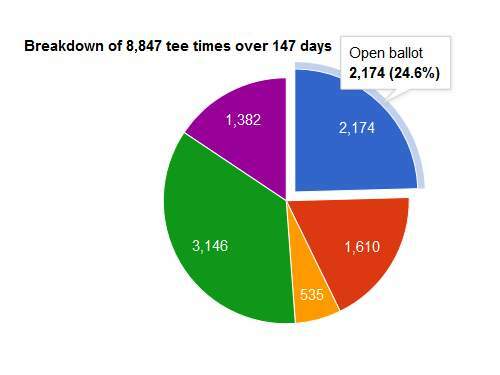 - I accept that matched dates will remain active on the BallotBuddy system to attract additional single players up to a total of four (a maximum of four golfers being allowed on one Old Course ballot application). I accept therefore, that on any given day my BallotBuddy may be one, two or three other single players. 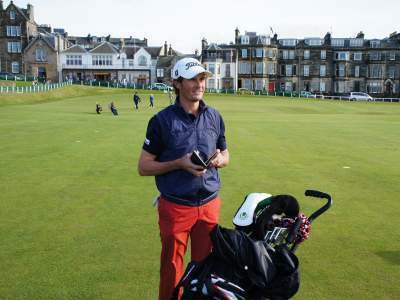 - I submit my details to join the BallotBuddy scheme in good faith and with best intentions and will use all reasonable endeavours to be available on all the dates above to play the Old Course via a successful ballot application. - If I get a date match and find a BallotBuddy, but I have a time restriction on my availability to play, I agree to make my BallotBuddy aware immediately and agree with them what time restriction, if any, to place on our ballot application. In case of any dispute, common sense and the majority view should prevail. Ginger Beer will not be obliged to intervene in dispute resolution. - Upon confirmation of my registration, I agree to share news of my BallotBuddy registration on my social media accounts and more generally with my friends, family and colleagues. i. This service does not guarantee that Ginger Beer Golf Travel will find a BallotBuddy for me. ii. Even if Ginger Beer Golf Travel finds a BallotBuddy for me, the responsibility to submit a ballot application rests solely and jointly with me and my BallotBuddy. iii. This service does not guarantee Old Course ballot success. iv. I hold neither Ginger Beer Golf Travel nor my BallotBuddy in any way responsible in the unlikely event that my BallotBuddy withdraws from the scheme at any stage, rendering invalid either: my Old Course tee time ballot application or: my participation in Old Course tee time, in the event of ballot success. Golf is a game known for the honesty and integrity of its players. Likewise, the success of this service relies 100% on your goodwill and honest intentions. I’m sure you would no more want to let down your BallotBuddy than be let down by them. So please only submit dates if you are committed to playing. To enter the ballot there must be at least two players and all names, Home Clubs and handicaps will be required. If successful, a current official handicap card (Golf Club affiliated to a Golf Union/Association), record or certificate must be presented to the starter prior to play. Maximum handicaps – 24 Men, 36 Ladies. Letters of introduction from your local Club Professional are not accepted. Duplicate ballot entries will be disqualified. Only the named golfers on the ballot entry are permitted to play. Dates without a number indicate where there is one single golfer seeking a BallotBuddy. Dates with a number indicate where there has been a date match and a BallotBuddy has been found. 4 golfers (0 slots remaining). Group is now closed. Where your preferred date already has 4 golfers and 0 slots remaining (and the group therefore is now closed) you are still encouraged to register on BallotBuddy. We will publish the date a second time, and indicate there is one single golfer seeking a BallotBuddy.